Following the receipt by the charity of a Queens Award for Voluntary Services 2018 two representatives of Community Care North Bucks were invited by The Queen to attend a garden party at Buckingham Palace. 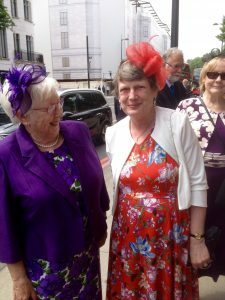 On Tuesday 5th June, Sue Watkins, the trustee responsible for the hospital car service,and Jacqui North, treasurer of the charity and one of the organisers at Young Carers evenings, put on their best dresses and hats and off they went! The weather was just perfect – sunny but not too hot. On arrival the guests – at least 2000 and probably more – were able to stroll around the full extent of the gardens admiring the flowers and shrubbery. Considering it was central London no traffic could be heard. Shortly before 4pm the Yeomen of the Guard came out, followed by the National Anthem. Then the Royal Family came onto the terrace. On this occasion Prince Charles and the Duchess of Cornwall were hosting the party on behalf of The Queen. They walked along the line of guests stopping to chat to one or two on the way. Then the attendees collected their tea and sandwiches and looked for a seat to rest their feet. During tea, Jacqui and Sue talked to some of the other guests, several of whom had travelled some distance and were staying in London for a few days. After tea the guests took the opportunity to go on the terrace and take some photos of the proceedings. All too soon it was time to go home. We had entered the garden through one of the side gates, but we left through the main gates at the front which enabled us to walk through a couple of rooms inside the palace. We had a wonderful day out – a once in a lifetime experience!